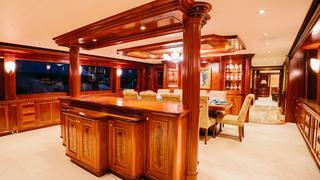 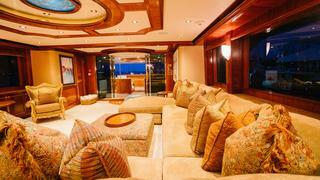 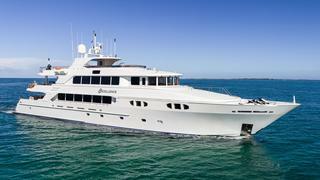 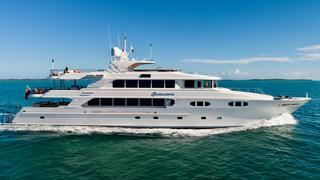 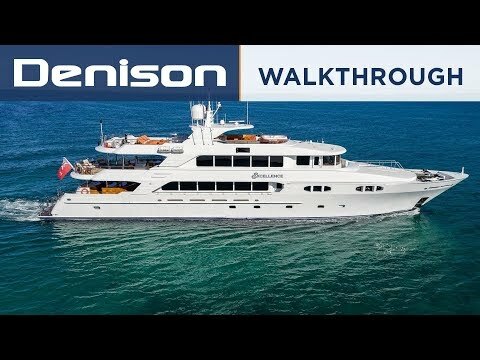 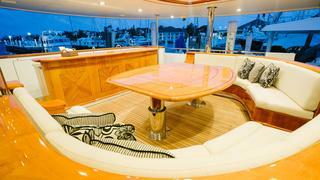 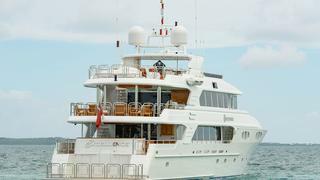 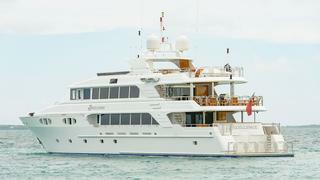 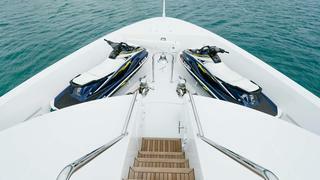 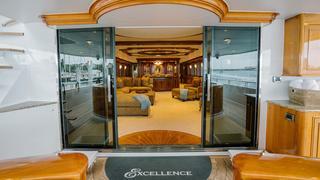 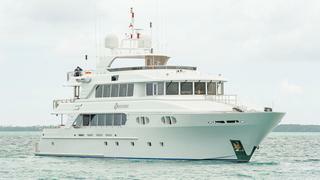 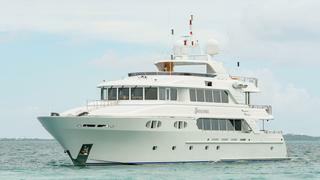 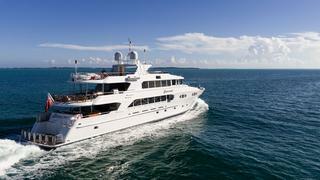 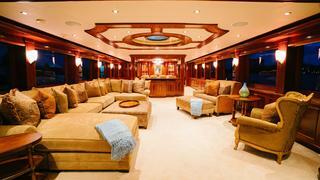 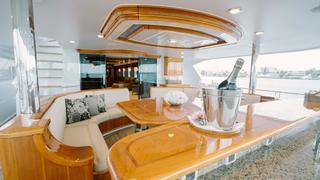 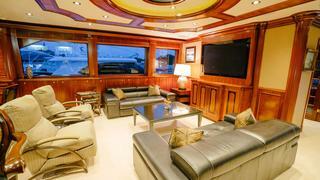 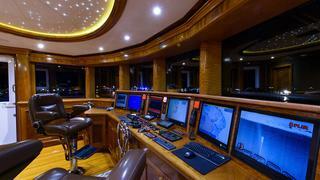 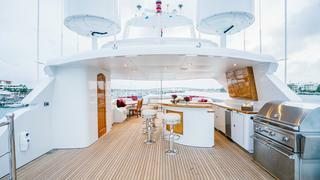 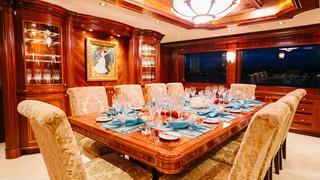 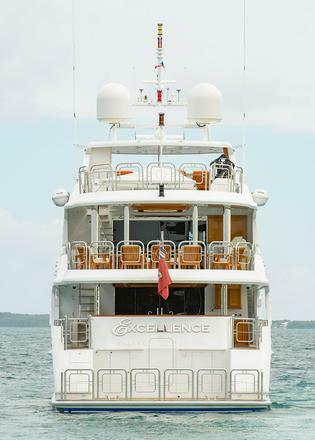 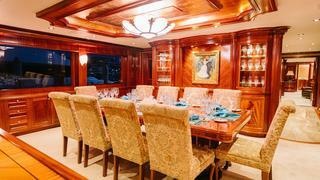 Excellence, a 2010 150’ Richmond Tri-Deck Motoryacht is the largest built at Richmond Yachts. 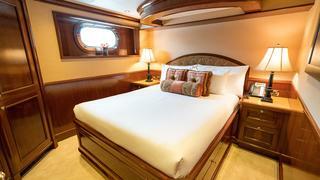 Five luxurious staterooms aboard Excellence can accommodate (10) and include a full beam master stateroom with King berth on the main deck and four additional guest staterooms on the lower deck all with private ensuite baths. 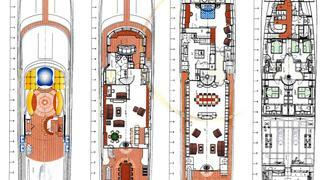 On the upper deck you will find a sixth luxurious VIP stateroom with an office that can accommodate (2) additional guests or be the perfect captain’s quarters. 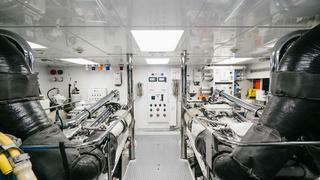 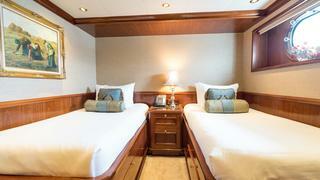 Five crew cabins accommodate up to (10) crew. 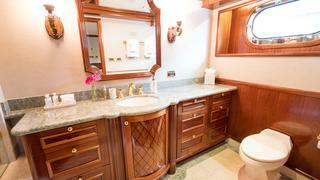 Elegant marble flooring adorns the vessel from the main deck entryway to all guest baths and the grand master stateroom bath. 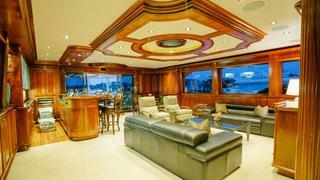 Intricate moldings framing overhead coffers are featured in the spacious dining and main salon areas. 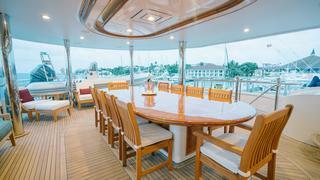 A stunning gold and white Murano glass chandelier illuminates cabinetry for crystal and china and a divider cabinet with a pop up TV screen and it glows at center stage above the dining table. 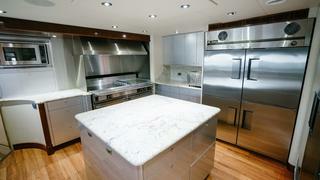 Granite countertops, a central island, commercial grade stainless steel appliances, and an abundance of food prep area and cold storage make for an impressive gourmet galley. 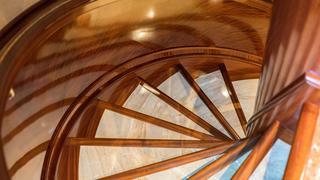 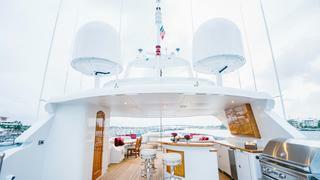 A central stairway forward of the dining area to starboard leads to the upper deck pilothouse, owner’s study and skylounge as well as to the lower guest accommodations. 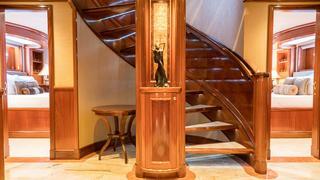 Featured in the stairwell, a side lit curved glass panel compliments the sculpted waterfall theme located on the upper deck. 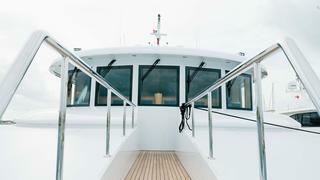 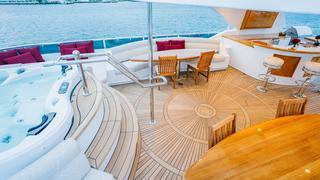 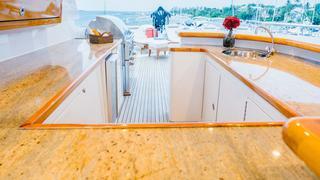 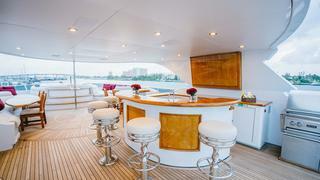 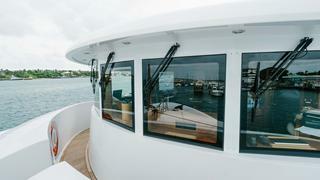 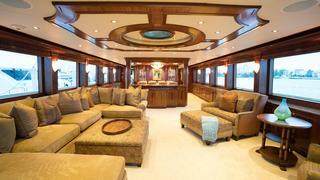 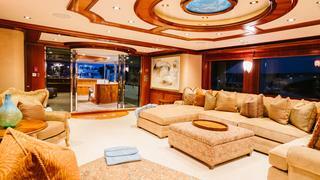 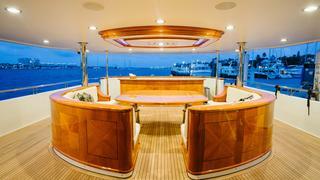 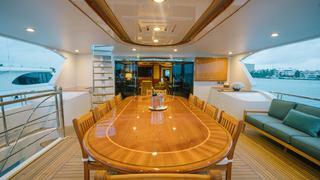 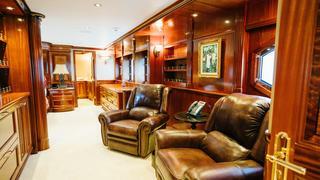 Forward on the main deck enter the owner’s suite through double doors into an intimate sitting area with flat panel TV. 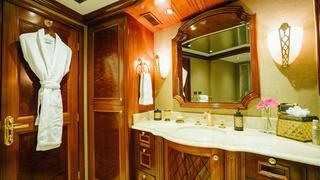 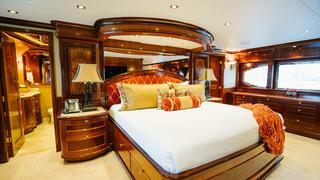 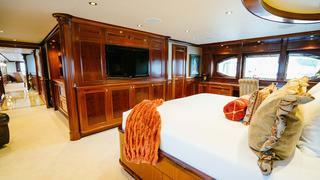 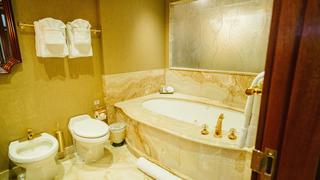 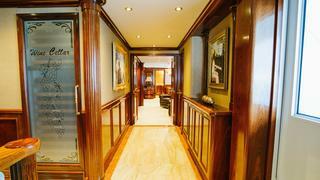 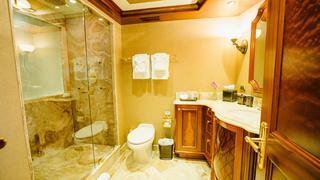 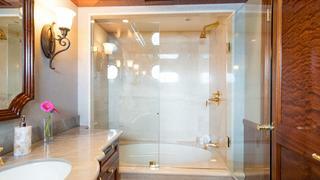 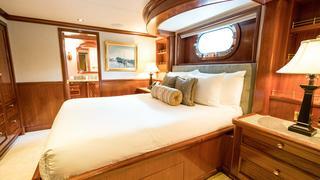 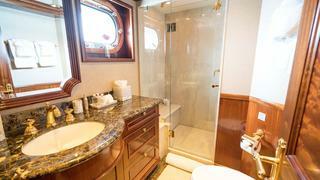 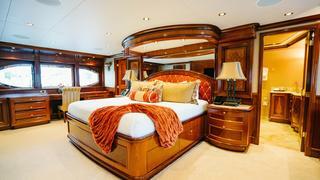 Centerline in the owner’s suite is a king sized bed and via port and starboard doorways, his and hers baths. 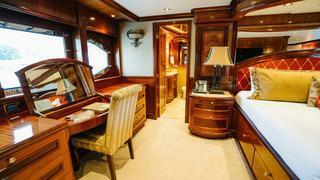 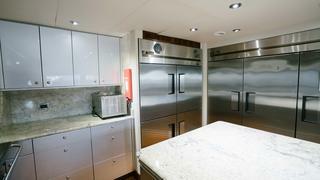 A large walk-in wardrobe can be accessed through a door in the port aft corner. 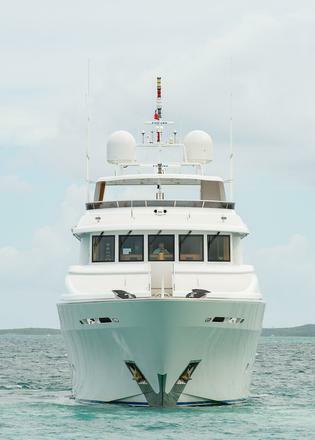 A central foyer midship on the lower deck gives access to four guest suites, three with queen sized beds and the fourth with twin beds to accommodate all of your guests. 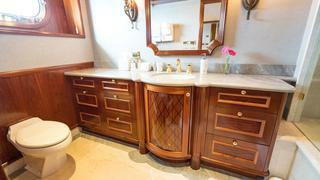 For convenience there is a refreshment cabinet below a hammered gold sink with two sub-zero refrigerator drawers and an icemaker in the lower foyer. 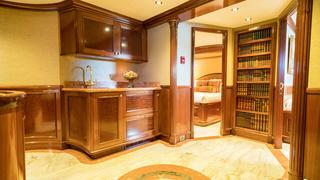 A concealed service door located forward in the lower foyer allows crew to easily access guest staterooms in order to provide superior service to your guests while aboard. 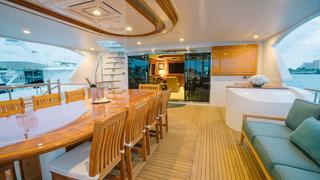 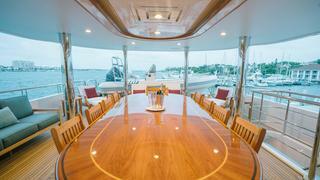 The upper aft deck, perfect for alfresco dining, features a gloss finished teak table that can accommodate 10. 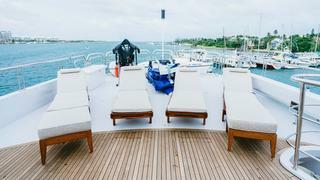 Guests will be comfortable even on the hottest Caribbean days with overhead air conditioning, gas grill, service bar and lounge chairs or chocks for securing an inflatable tender. 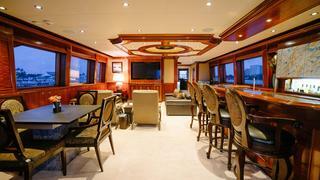 The skylounge, just inside the upper deck, is perfectly outfitted for your guest‘s enjoyment. 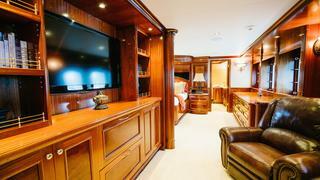 They can relax in comfortable inviting sofas while watching the large flat panel TV, pull up one of four custom bar stools to the full walk behind bar or enjoy a game at the game table. 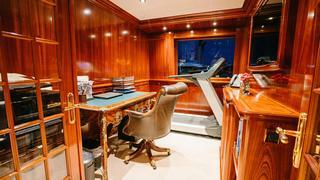 Forward you will find the owner’s study with beautiful beveled glass French doors, desk and credenza. 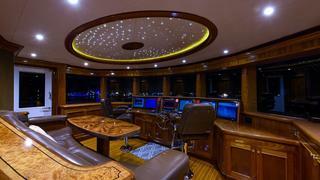 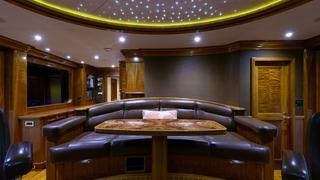 Forward of the central staircase, the wheelhouse with impressive vertical windshield enhances the 9’1” domed overhead arrayed with fiber optic lights resembling the night sky. 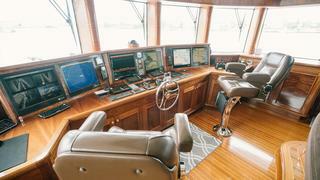 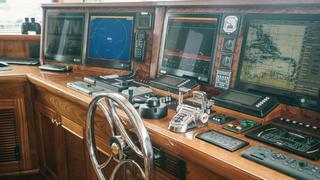 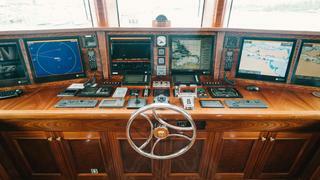 A leather topped console houses a six screen navigation display and two Stidd helm chairs and a raised lounge that accommodates six provide comfortable seating. 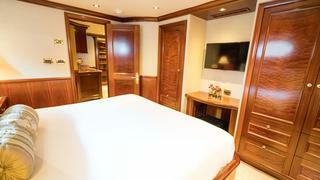 A VIP suite with a queen berth and ensuite bath adjoins the pilothouse offering outstanding portside views and can also serve as the captain’s cabin. 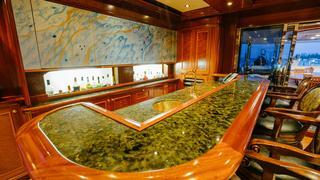 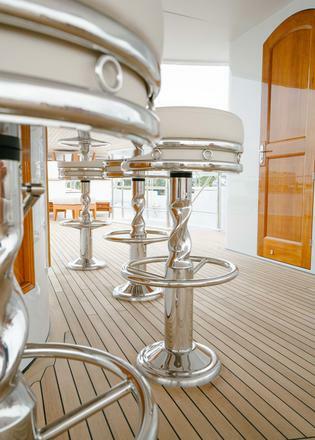 The sun deck was designed with Excellence in mind. 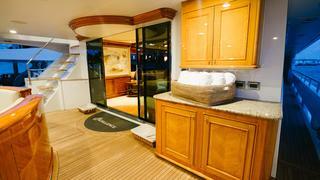 Forward, the jetted hot tub between raised sun pads offers complete serenity for your guests. 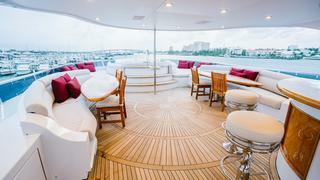 Shade is provided by a large composite hardtop overhead a semicircular bar, five fixed barstools, day head and curved settees. 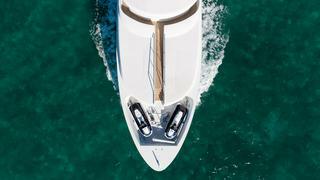 Richmond Yachts excelled when to the far aft they designed a helicopter pad surrounded by fold down railings for touch and go operations as needed. 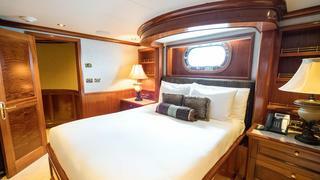 Crew quarters are accessed by a stairway from the galley and are forward on the lower deck where you will find a double berth stateroom which can serve well as the captain’s cabin and also two twin bunk ensuite staterooms. 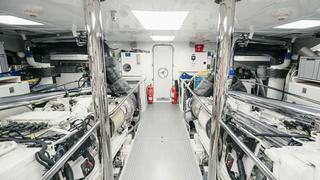 Two washer and dryers in the laundry/utility area and a large mess for the crew offer comfortable accommodations and located aft is an engineer’s cabin with easy access to electrical equipment and machinery along with wet suit locker and tank storage in the dive center.